Ooooh! I want one! Look at that baby shine! Wow. That is nice. How much bodywork and repairs had to be done before paint? There was a ding the size of your index finger in the leading edge of the wing, the nose bowl was in need of some work but nothing dramatic, the larger glass was difficult to massage into place - we also went with Knots2U for flap ,aileron and Stabilator gap seals also up-graded to 160 H.P with Ram when the engine was overhauled. 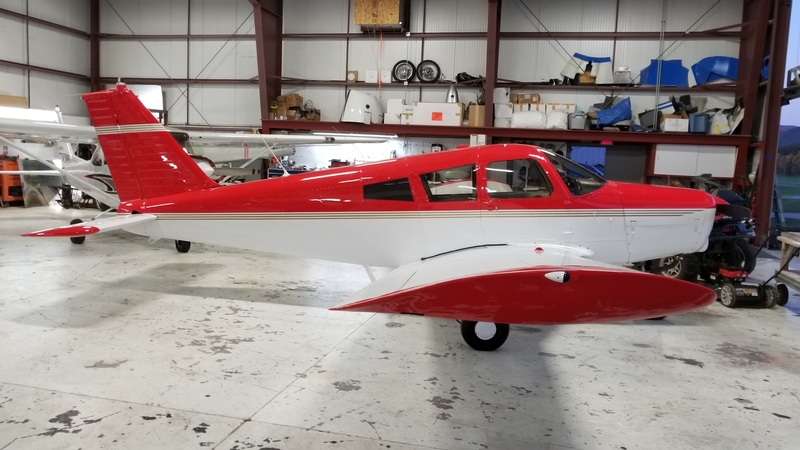 The only extra that was last minute was the painted third window, I realize with everything I spent I will never re-coup what I have into the plane ($42000) but this plane has been with us for 41 years and we know it inside and out with no surprises! Cool. I thought the rear window was painted. It is also a great time to do all those speed mods. Any interior photos? I am replacing my headliner..in process today.